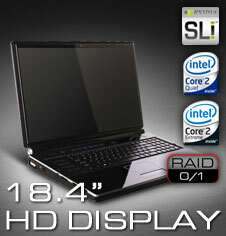 This 18.4 inch Mobile Workstation and Gaming notebook sports most up-to-date hardware like the Mobile Quad-Core and Quad Core Extreme processors from Intel, a new GTX 280M graphic cards in Single or Dual SLI configuration, DDR3-1333 memory or three physical hard drives in RAID 0/1 configuration. The machine is similar to other Eurocom models in terms of outward appearance and expansion capabilities. The EUROCOM M980NU XCaliber is a high-end notebook computer, similar to high end desktop workstations. It combines superb mechanical design with high performance, high reliability and expandability.